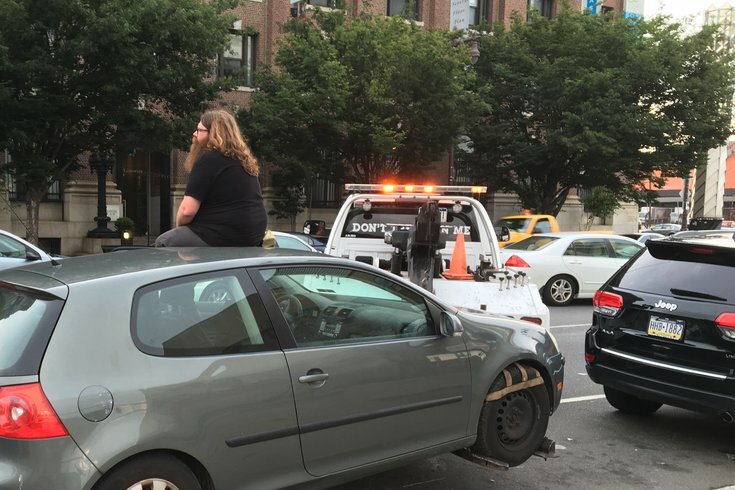 This photo shows Adam Malliet sitting atop his car in protest as a tow-truck operator attempts to haul it from a space on South Broad Street in July. State Rep. Angel Cruz (D-Pa) has taken South Philly's bait-and-trap towing scheme as an opportunity to push for support for a bill that's intended to protect both drivers and towing companies. House Bill 550, which Cruz plans to reintroduce if he is reelected in the upcoming November election, could require tow truck operators to photograph and present pictures of illegally parked vehicles to motorists. Escalating it beyond an ordinance level, the potential law could mean more serious repercussions for anyone who would try to skirt around, or be untruthful, about the process. "I think it's time to say what's fair is fair," Cruz said. Cruz said the idea for the bill stemmed from a personal experience. Cruz's state vehicle that he said was parked legally was towed in Center City about four years ago. He thought enacting legislation to fix the process was the best possible solution. He's not the only politician who's trying to take predatory towing head on. Councilwoman Maria Quiñones-Sanchez (D-Philadelphia) has already presented legislation to City Council that would oversee privately owned tow companies. "If you put up a sign and tow from a place that is not on our registry, then you're going to be held liable and fined and sanctioned," Quiñones-Sanchez told 6ABC. Hearing notices have been sent on her bill that hopes to create an inventory that tracks driveways and parking spaces that are legitimately illegal. Cruz's announcement comes days after news broke of an alleged bait-and-trap scheme targeting cars in South Philly. Many motorists claim that they parked in legal spots only to find their cars towed by George Smith Towing with a new tow sign placed where their vehicles once stood. Karen Guss, communications director at the Philadelphia Department of License and Inspection, said she's aware that the city struggles with a predatory towing problem and that it has developed a task force that is trying to round up solutions. "(The bait-and-trap scheme) is something that is of great interest, and we feel that Philadelphians shouldn't be victimized," she told PhillyVoice on Wednesday. "We want to find out the best way that as a city government, we can help bring in the solution." The Philadelphia Police Department confirmed Wednesday that there is an open investigation with the Major Crimes Unit related to the issue. Cruz wouldn't comment on specifics involved in the alleged bait-and-trap scheme, but admitted that something wasn't right. "What I saw visually," he said, "we have a problem."